I have an RGB pixel that I'd like to colorize in my program (I'm using GLSL) very similar to how the GIMP "Colors > Colorize" function works. What calculations can I perform to determine the output pixel hsv? But I'm a little lost on how to calculate output saturation and value. seems to produce good results when colorize inputs S=1 ([0, 1]) and V=.5 ([0, 1]). I'm still struggling to generalize these formulas for when S!=1 and V!=.5. It appears to me that in the image, the saturation of the original image is 0 since it is grayscale. (Unless I've misunderstood the question.) 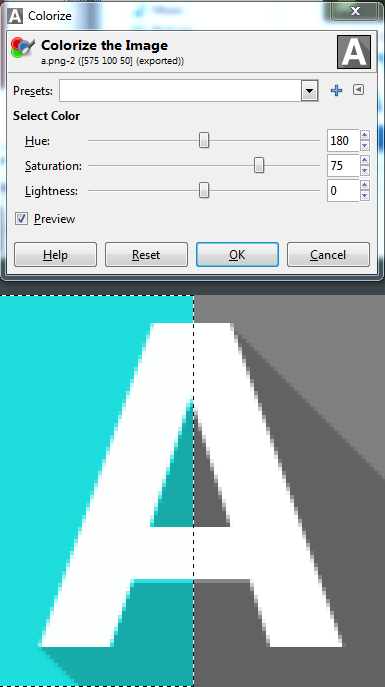 When the saturation is 0, the hue is undefined, but it appears that the GIMP is setting the hue to 0. It is then using the sliders from the dialog to modify the HSL. It adds 180° to the hue (so from 0 to 180 which gets you from red to cyan). The saturation is increased by 75 units, and the lightness is kept the same. It may have special protections for black and white, given that the white part of the letter "A" remains white in the final image (although even there, it appears to have an RGB value of (0.99, 1.0, 1.0), whereas on the right, it's fully white (1.0, 1.0, 1.0)). You can always look at the source code since it's an open source package. Not the answer you're looking for? Browse other questions tagged transformations glsl color 2d pixel-shader or ask your own question.